Gamma Knife surgery is recognized worldwide as the preferred treatment for brain tumors, arteriovenous malformations and brain dysfunctions such as trigeminal neuralgia. The Gamma Knife offers a non-invasive alternative for many patients for whom traditional brain surgery is not an option. Gamma Knife surgery removes the physical trauma and the majority of risks associated with conventional surgery. This effective single session treatment may require an overnight hospital stay, but is often done in an outpatient surgical setting with periodic follow-up. It has been proven safe over the long term and is recognized and covered by insurance plans. The same as neurosurgery, the Gamma Knife allows noninvasive cerebral surgery to be performed in one session and with extreme precision, sparing tissues adjacent to the target. 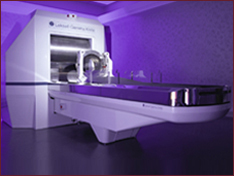 Based on preoperative radiological examinations, such as CT scans, MR scans and angiography, the unit provides highly accurate irradiation of deep-seated targets, using a multitude of collimated beams of ionizing radiation with scalpel-like precision. Gamma Knife surgery represents a major advance in brain surgery, and in the last three decades has changed the landscape within the field of neurosurgery. Its development has enhanced neurosurgical treatments offered to patients with brain tumors and vascular malformations by providing a safe, accurate and reliable treatment option. Gamma Knife enables patients to undergo a non-invasive form of brain surgery without surgical risks, a long hospital stay or subsequent rehabilitation. 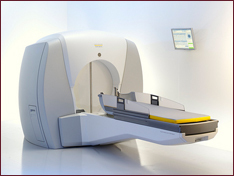 Like other radiosurgery, Gamma Knife surgery is unique in that no surgical incision is made to expose the inside of the brain, thereby reducing the risk of surgical complications and eliminating the side effects and dangers of general anesthesia. 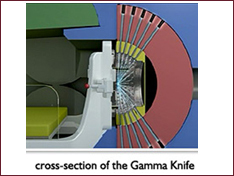 The "blades" of the Gamma Knife are the beams of gamma radiation programmed to target the lesion at the point where they intersect. In a single treatment session, 201 beams of gamma radiation focus precisely on the lesion. Over time, most lesions slowly decrease in size and dissolve. The exposure is brief and only the tissue being treated receives a significant radiation dose, while the surrounding tissue remains unharmed. With the Gamma Knife, a surgical incision is not required; the attendant risks of open neurosurgical procedures (hemorrhage, infection, cerebrospinal fluid leakage, etc.) are therefore avoided. Gamma Knife may be used as an alternative to standard neurosurgical operations or as an adjunctive therapy in the treatment of residual or recurrent lesions left unresected by conventional surgery. Radiosurgery can be especially useful for those patients who are not suitable for standard surgical techniques due to illness or advanced age. In many neurosurgical cases, the Gamma Knife is the only feasible treatment. 1. Intracranial tumors such as acoustic neuromas, pituitary adenomas, pinealomas, craniopharyngiomas, meningiomas, chordomas, chondrosarcomas, metastases and glial tumors. 2. Vascular malformations including arteriovenous malformations. 3. 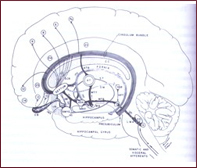 Functional disorders such as trigeminal neuralgia , Parkinson's disease and obsessive-compulsive disorder. 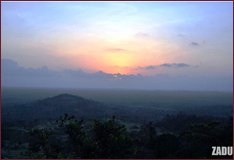 Mindus et. al. at the Karolinska Institute reported the effects of such procedures on the anxiety symptoms and personality characteristics presented in conjunction with results of imaging studies performed by MRI and PET. At the 12-month follow-up, statistically and clinically significant improvement was noted in all assessments of symptomatic and psychosocial function. Negative effects on the personality were not noted. Behind these numbers are numerous examples of dramatic improvements in individual lifestyles. A number of patients were preoperatively unable to work or function socially owing to such problems as preoccupation with personal cleanliness and the inability to use public transportation, with resulting domestic confinement, aggravated psychological problems, deterioration of family relationships, and devastation of personal economy. Postoperatively, these patients could return to their previous occupation and to a normal social function. 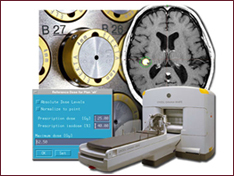 Gamma Knife is a neurosurgical tool designed exclusively for the treatment of brain disorders. Gammacapsulotomy offers several important clinical as well as scientific advantages over capsulotomy via an open technique. The most important is patient tolerance. It is our experience that this psychologically vulnerable group of patients is much more willing to undergo a closed stereotactic procedure, which in contrast to open surgery, leaves no external marks. Theoretically, the gradual development of the radiolesion may also allow the patient better psychological adjustment to his new situation. 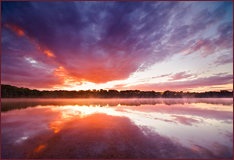 The psychological rehabilitation phase is an important part of any psychosurgical procedure.